Look at me, look at me, look at me now! 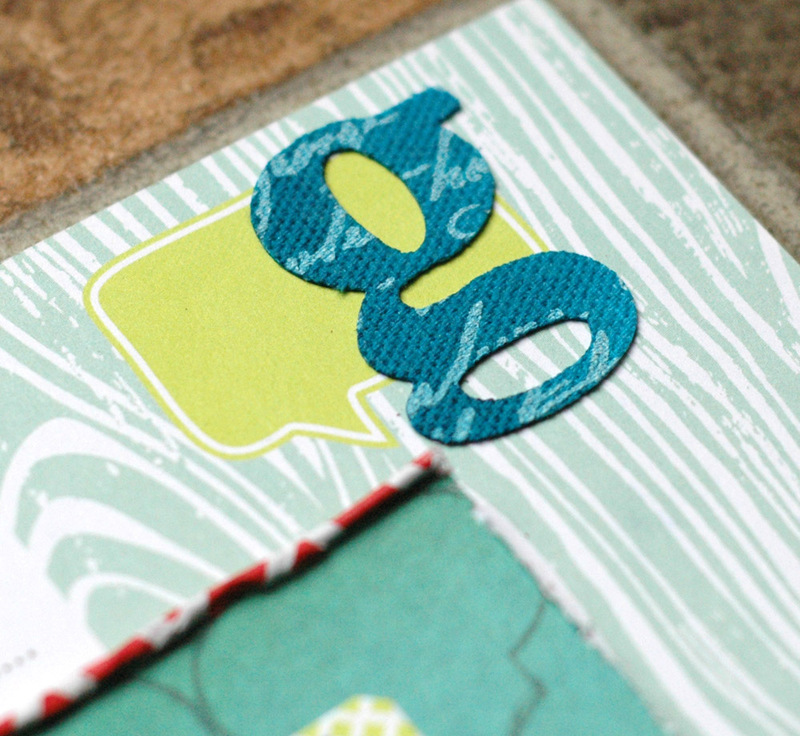 While at the Paperie retreat last month I managed to do a bunch of LO’s – way more than I usually do. Some were already started (from the KP weekend) so just need pics to be finished off, some were demos (showing the Primary Elements) that I wanted to complete, and others were from scratch. 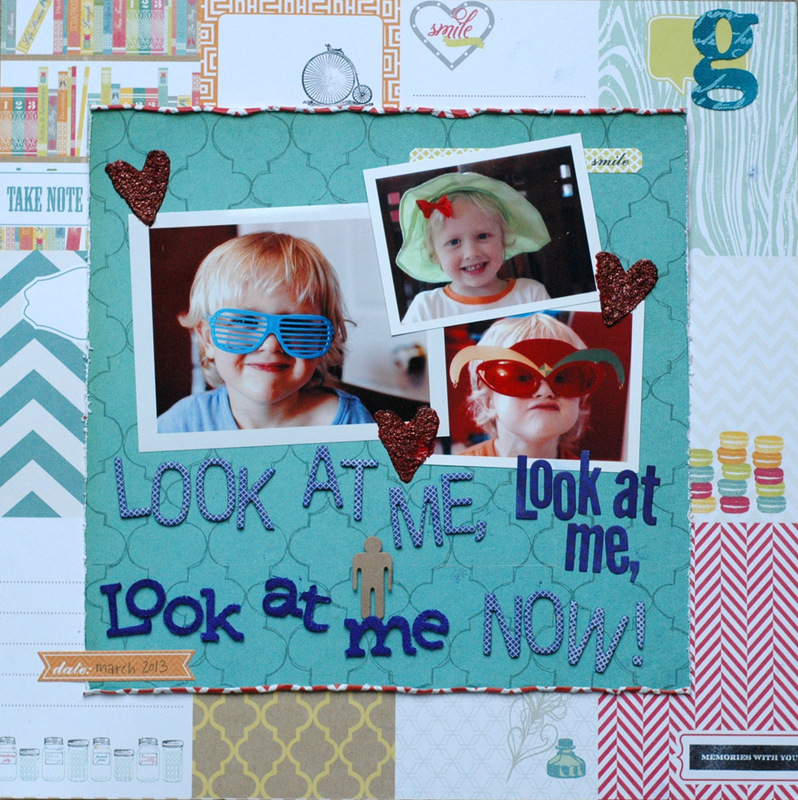 This one is from the exclusive retreat kit that the Paperie sold – they did a scrapbook kit and a card kit (yes, they’re starting a bimonthly card kit!) and the stuff in both was awesome! The scrapbook kit had 12×12 paper that could be cut into tags and, while I always love that type of paper, I find that I use one or two tags and that’s it. This time I was determined to use the whole sheet. So it became my background! For a bit of colour contrast, I rolled the edges of the paper I used to mat and ground my photos because the “B” side was a good pop to the “A” side pattern. And the Prima alpha stickers that came in the kit? Fabulous! They’re a mistable fabric resist that I just had to colour with the new Dylusions Ink Spray. I also used the same colour, Calypso Teal, for the letters in the title. A bit of a crazy LO but the fun wonkiness seemed to fit with the crazy Gabe pictures! I’m hoping to get a sneak peek or two out in the next day or so of an upcoming class. This is going to be a great ongoing project, but all the work is done for you! It’s a 7 Gypsies Library Drawer and we’ll fill it with written and photo memories. The nice thing? You can do it for a year, or three, or just one special event! Sign up, I promise you won’t regret it! Plus we’ll be playing with the new Tim Holtz Remnant Rubs, Luminarte Primary Elements, and Radiant Rain Shimmering Mists! Make sure you follow me on twitter and instagram so you get the peeks as soon as I post them! P.S. By request, I’m going right now to upload Ella pictures to Flickr! So cute!!! Love the pictures.